RB-VHDDD8 3G/HD/SD-SDI De-Embedder Dolby® E & Dolby Digital Decoder & Re-Embedder. 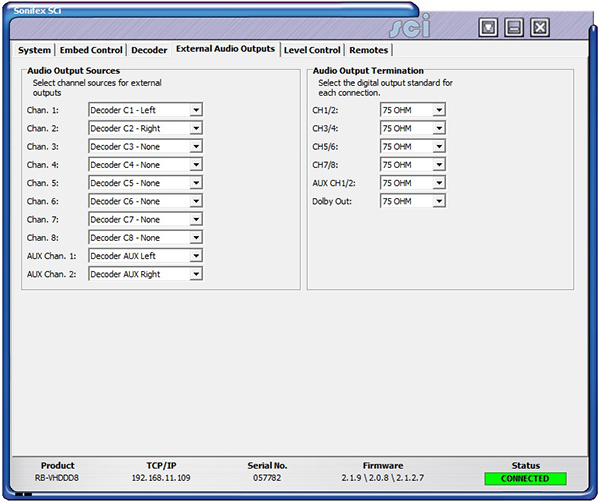 The RB-VHDDD8 is an SDI audio de-embedder and re-embedder with Dolby E & Dolby Digital Decoding capabilities. 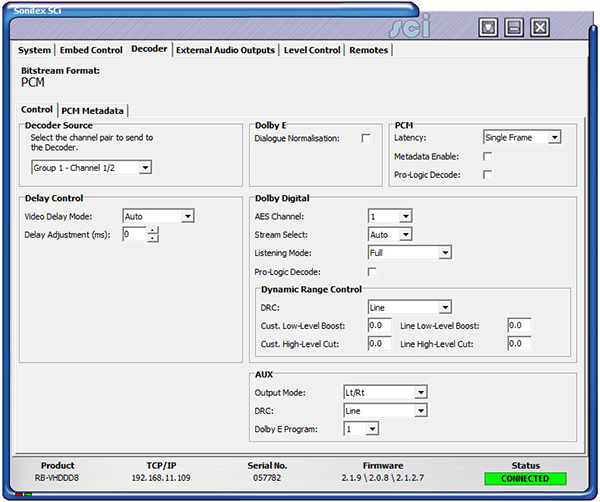 It de-embeds and decodes a selected Dolby E or Dolby Digital bitstream embedded in the video input. The outputs from the decoder and the de-embedder can then be re-embedded onto either of the two SDI outputs and also transmitted on a BNC or D-type situated on the rear panel. The encoded Dolby bitstream is also available via a dedicated output on the rear panel. The digital audio output connections are transformer-coupled balanced line interfaces and can be configured to be either 75ohm (AES 3ID) or 110ohm (AES 3) output impedance through either a BNC or via the D-type connector. These output connections are paralleled, allowing one type to be used per output. The metadata output from the decoder is transmitted using RS-485 via the external 9-pin D-type on the rear panel and can also be embedded into the vertical blanking space (SMPTE-2020) oof the two SDI outputs. There is also remote I/O available from the rear panel through a 25 way female D-type connector. These are fully configurable. The unit is controlled locally through the front panel display but can also be remote controlled via an Ethernet connection using the Sonifex SCi software. Audio embedding is the process of taking one or more audio signals, formatting them into packets and then placing them into the ancillary or blanking space of a video signal. 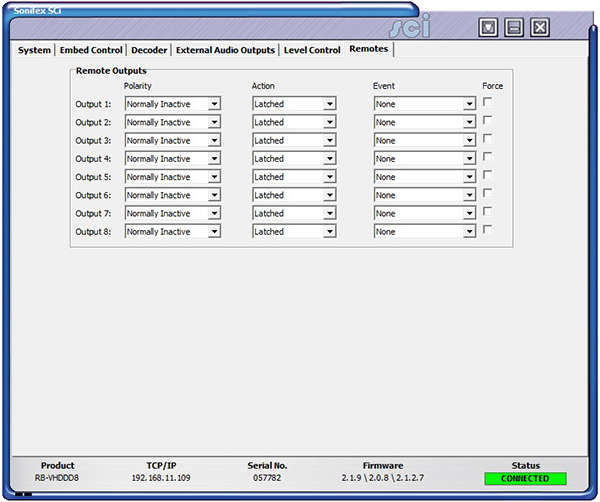 Audio de-embedding is the process of retrieving this audio data from the video signal but not necessarily removing it. These two processes are standardised by two SMPTE documents, SMPTE-272M for SD-SDI and SMPTE-299M for HD-SDI and 3G-SDI. 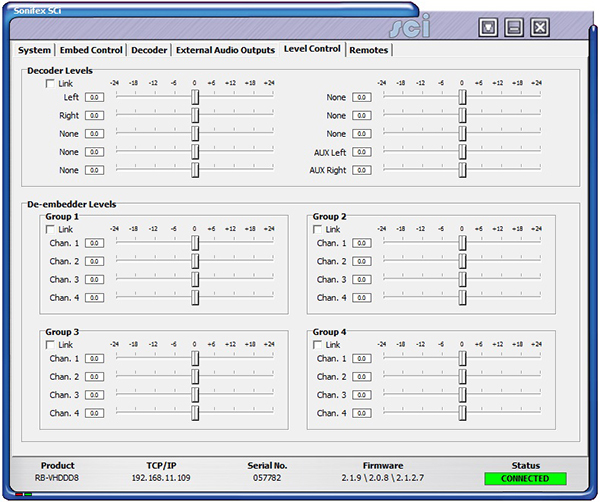 Both of these standards allow for the embedding of 16 channels of 24-bit, 48kHz audio. Which are divided down into 4 groups of 4 channels. 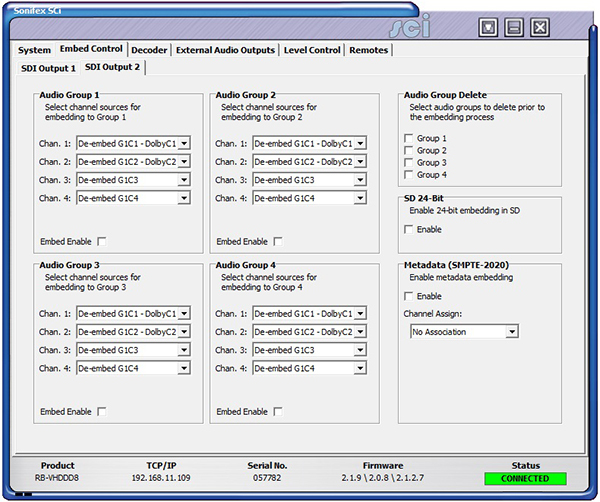 Each standard consists of a control packet and an audio data packet. 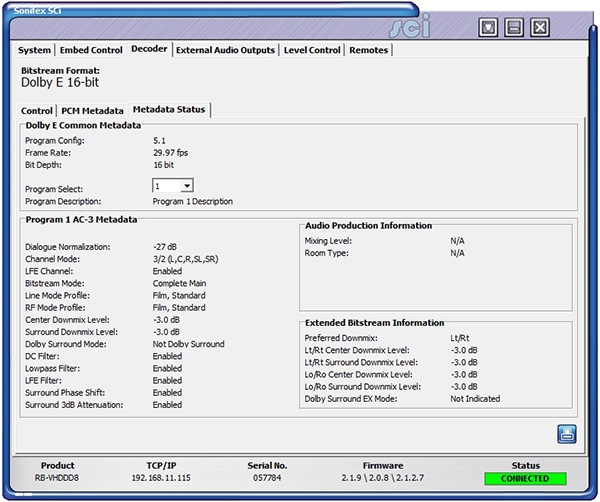 The control packets hold certain control information about the audio to aid in the de-embedding process or any other receiving equipment. There is one control packet per group, these packets are optional for SD. The control packet is normally placed in the horizontal blanking period once per field or frame. 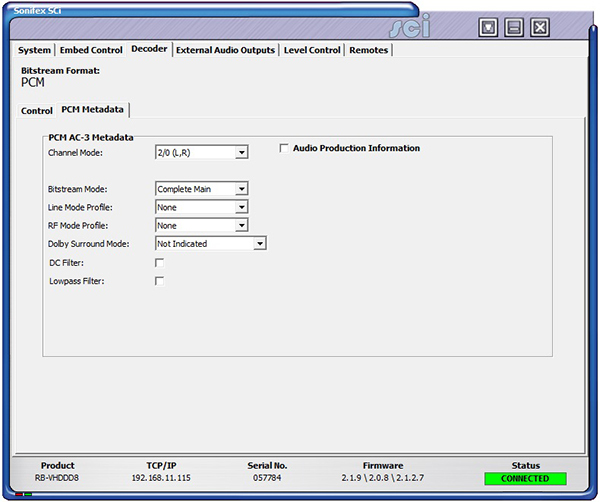 The audio data packets contain the actual audio sample data. There are considerable differences between SD and HD, the main ones being that SD data packets contain only 20-bit data and are of variable length while the HD data packets contain 24-bit data and are of fixed length. 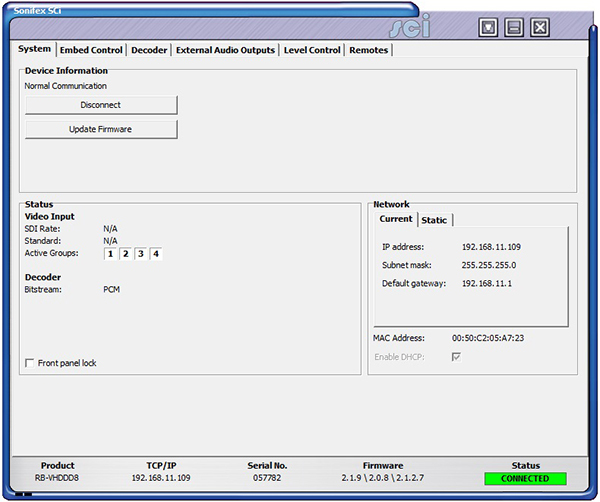 The HD packets also provide an error correction and detection method. The SD standard consists of a further packet, the extended data packet. These packets contain the 4 least significant bits of the audio samples to provide full 24-bit audio.